There are no true cedars native to the Pacific Northwest, and the false cedars are sometimes easily confused with one another. Here is a brief summary of distinguishing characteristics that can help identify the different species. 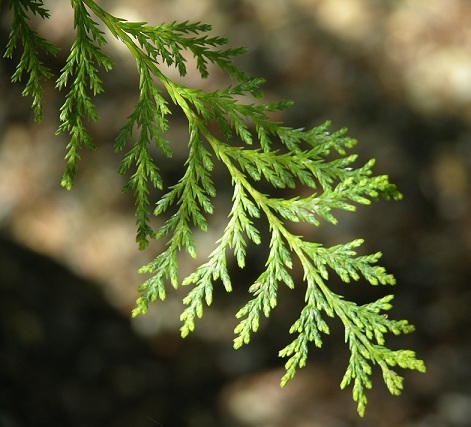 Alaska Cedar (Chamaecyparis nootkatensis): Alaska cedar has no distinguishing white markings on the bottom of its scale-like leaves. This tree also grows much smaller than the other false cedars. Unlike Red Cedar, the foliage is somewhat prickly and the branches create more of a “weeping” appearance. Its range is confined to cold and wet areas near timberline, north from the Cascades of Oregon into Washington (including the Olympic Peninsula) and British Columbia. Incense Cedar (Calocedrus decurrens): This is the only northwest false cedar for which the scale-like leaves are much longer than they are wide; the tiny leaves are sometimes described as resembling the shape of a wine glass. Incense Cedar does not get as large as Red Cedar, and the younger trees tend to grow in the shape of a pyramid rather than conical. The most distinguishing feature of this species is the small cones that look very much like a duck’s bill before they open. It grows naturally in the forests of Oregon’s Cascades and south into California. Western Red Cedar (Thuja plicata): Bearing a marked resemblance to the Port Orford Cedar, the Western Red Cedar is easily distinguished from it's "false cedar" peers by the discerning naturalist. Each tree holds both male and female cones, but on separate branches. The male cones are small and reddish, but the 1/2 inch female cones are upright and bent backwards along the branch. Another unique trait is the white butterfly or bow-tie shape underneath the leaves where they meet in a regular repeating pattern. Preferred habitat for Western Red Cedar are boggy, lowland forests or in the mountains with Douglas Fir (Pseudotsuga menziesii var. menziesii) and Western Hemlock (Tsuga heterophylla) where it displays startlingly green and retains the lower branches as it ages.